The North Carolina Community Foundation was honored to welcome fundholders, board members, partners and community leaders to NCCF's new office space for an evening of appreciation. The Open House provided an opportunity to say thank you to all those that have made the work of the Foundation possible and to dedicate the new conference center in honor of Lewis Holding, NCCF's founding chairman. Olivia Holding, the niece of Holding, was on hand to give remarks and dedicate the new Lewis R. Holding Philanthropy Center. 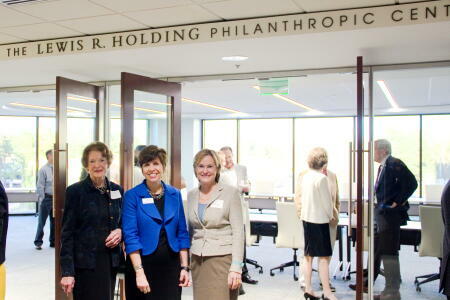 Pictured above is NCCF CEO Jennifer Tolle Whiteside (middle) posing with Olivia Holding (right) and Ella Ann Holding following the dedication of the Lewis R. Holding Philanthropy Center. 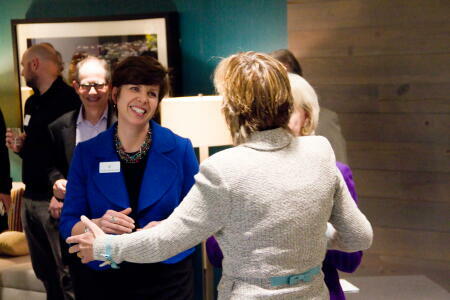 Pictured is Tolle Whiteside (left) smiling for a hug from Holding following Holding's remarks at the Philanthropy Center dedication. Friendly conversations are pictured above at the Open House between (left to right) outgoing NCCF Board Chair Linda Staunch and Ella Ann Holding as well as Olivia Holding and incoming NCCF Board Chair Jim Black. 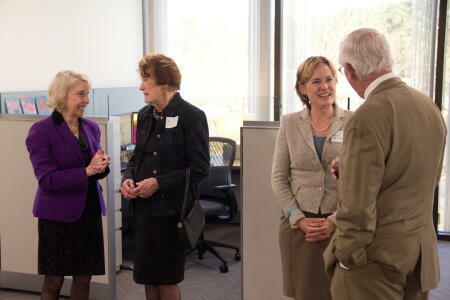 Pictured is Olivia Holding (middle) enjoying speaking with fundholders, board members, partners and community leaders at NCCF's Open House. Click here to read more about the founding of NCCF and the legacy Lewis Holding left to benefit North Carolina. 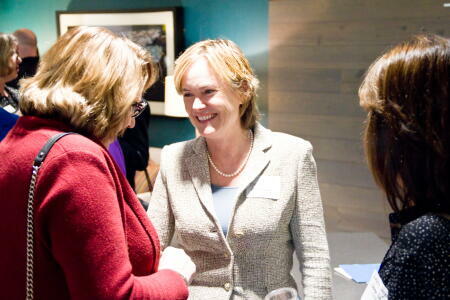 Click here to view more photos from the happy evening.